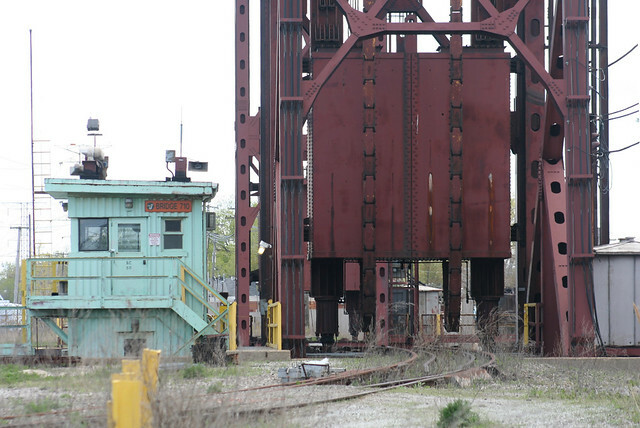 In the long-delayed Part Three of a look at Chicagoland’s moveable railroad bridges, we’ll visit all ten of Chicago’s vertical lift bridges – starting at the far south and moving north. 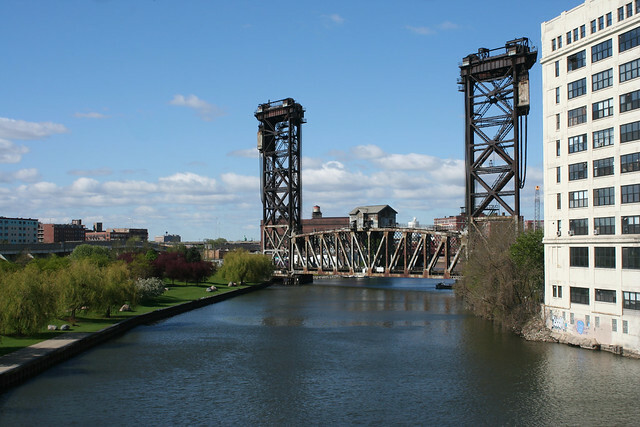 Vertical lift bridges consist of two towers housing counterweights and cable systems, with a moveable span between them which rises directly up when needed. 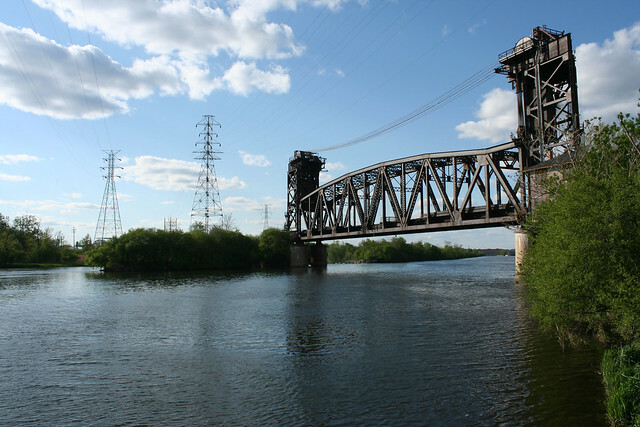 They are often used for longer crossings and places where a waterway must be crossed at an angle. 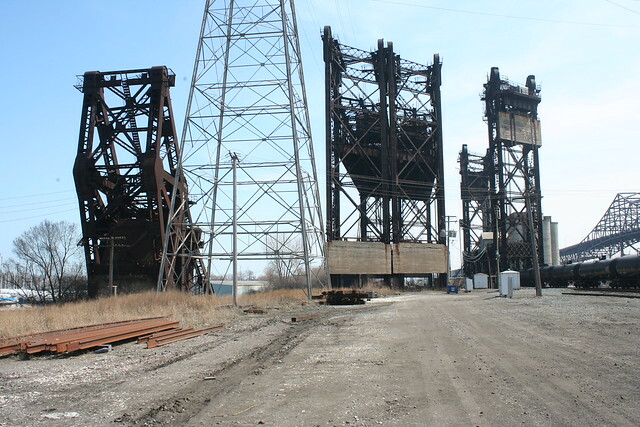 The towers, often reaching up to 200′ in height, are highly visible in Chicago’s flat landscape. 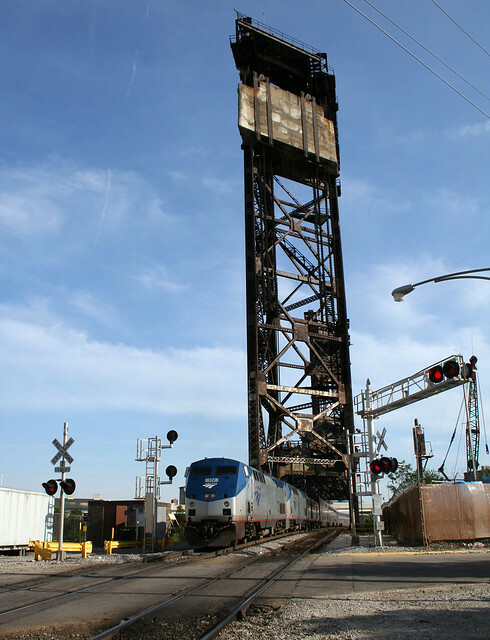 Nearly in the center of downtown Joliet, this bridge still sees occasional use by trains. 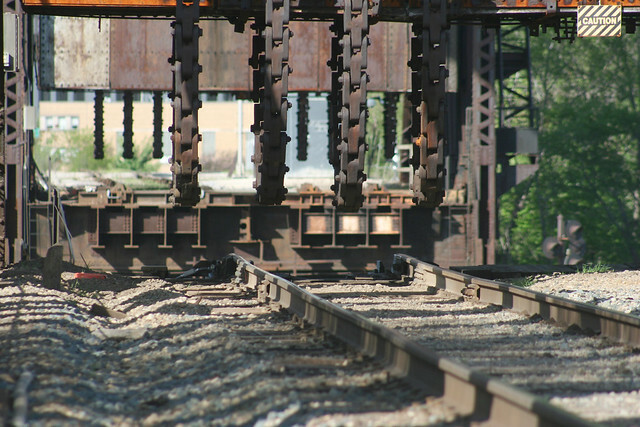 It remains in the open position until needed by a train. 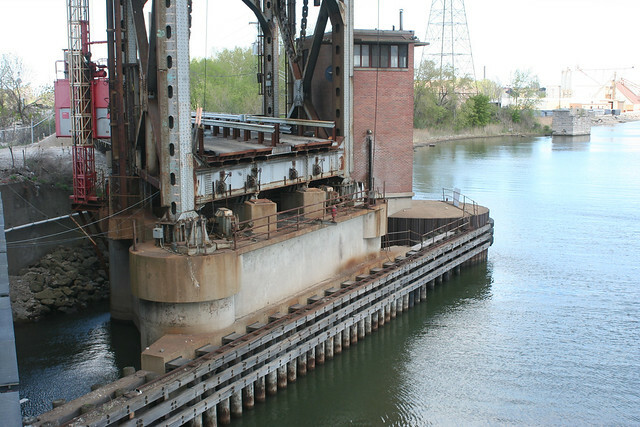 The bridge is one of a long sequence of moveable bridges lining the Joliet River as it passes through town. 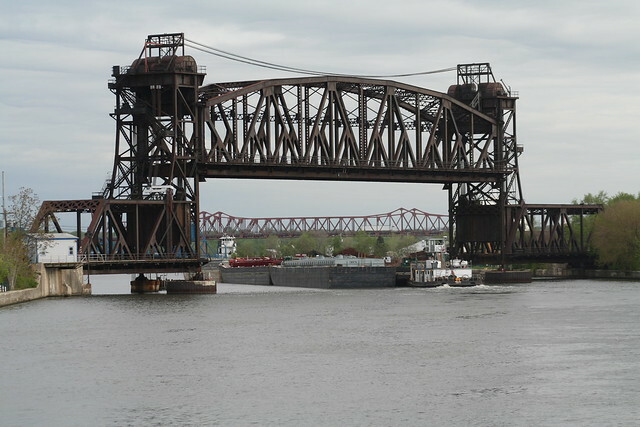 Barges necessitate the frequent opening of the bascule bridges seen in the distance. 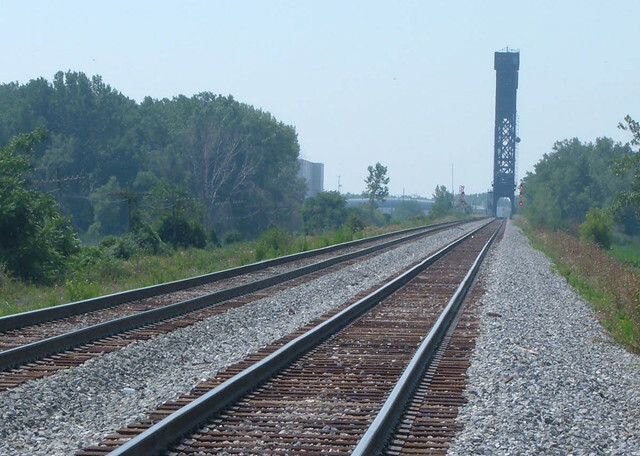 Not easily accessible, this bridge sees frequent rail traffic on the CN main line. 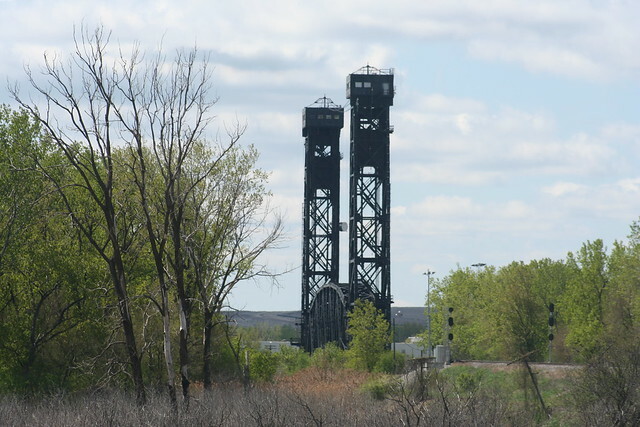 Two bridges standing side by side dominate the landscape of S. Torrence Avenue, visible from miles away. 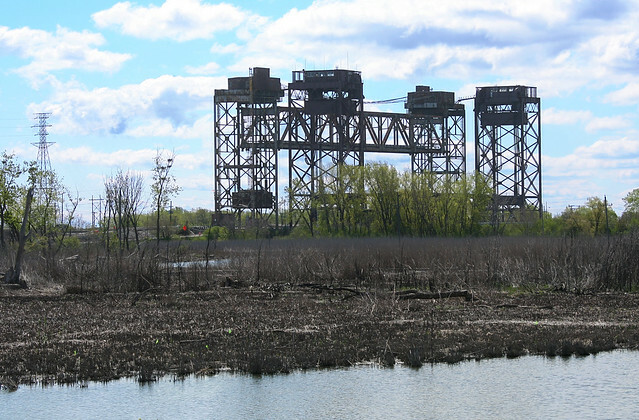 Much of the surrounding terrain is marshland and remains undeveloped, lending further prominence to these two massive structures. 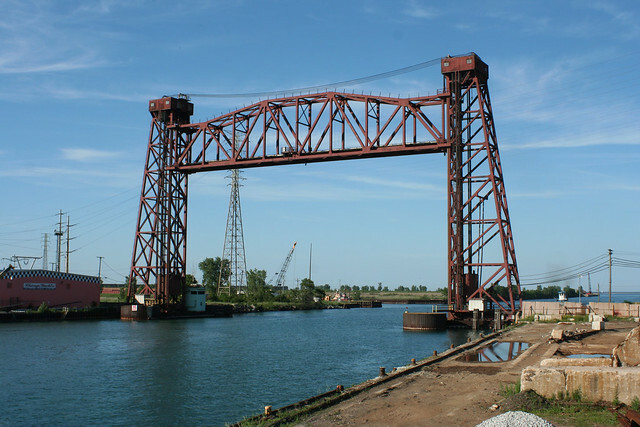 The lowered bridge, recently rehabilitated and still in active use, is a road bridge, carrying Torrence Avenue over the Calumet River. It was built in 1938. 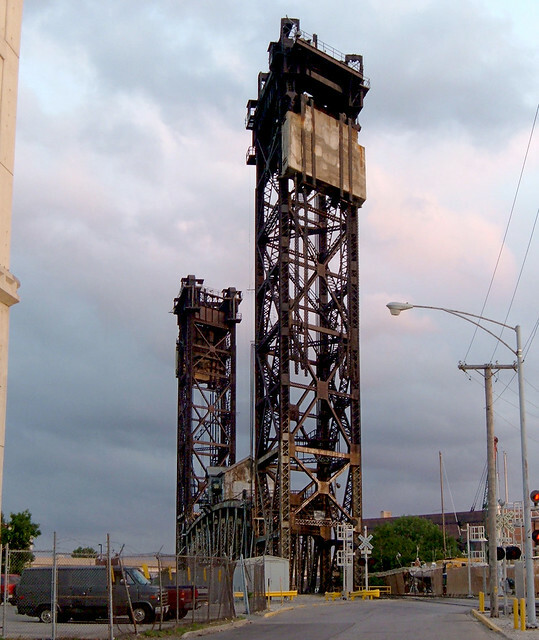 In the photo above, it appears in its previous steel gray paint; post-renovation, it sports the common Chicago maroon. 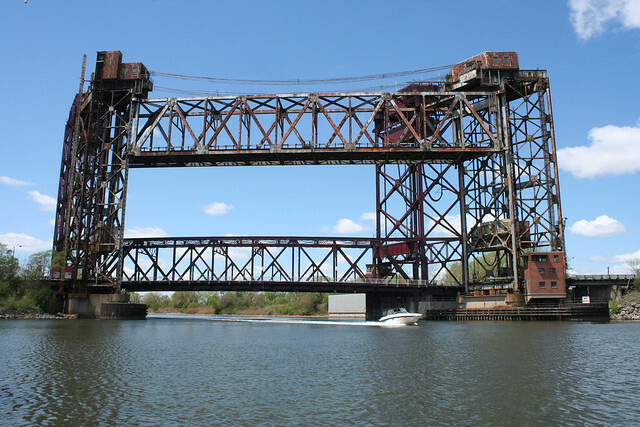 The raised bridge is an abandoned railroad bridge, built in 1968. 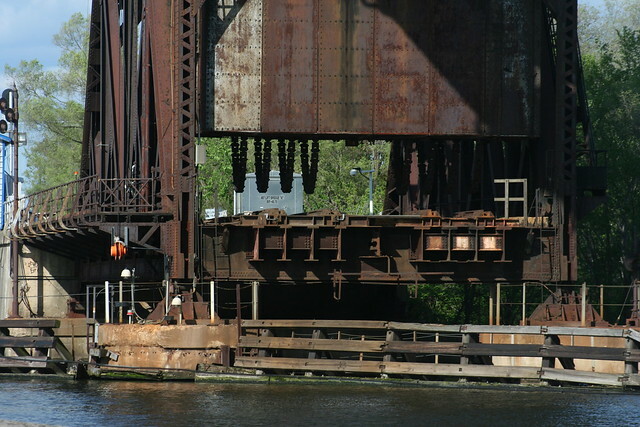 During renovation of the road bridge, the rail bridge was lowered and used as a bypass for the road. 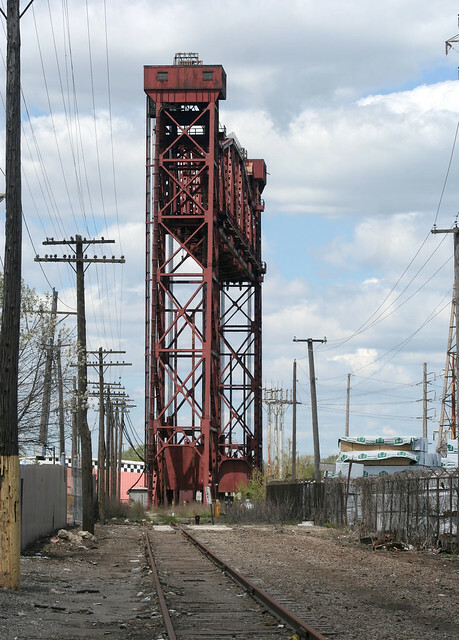 A double-track rail bridge over the Calumet River, only a few hundred yards’ distance from the Torrence Avenue bridges. 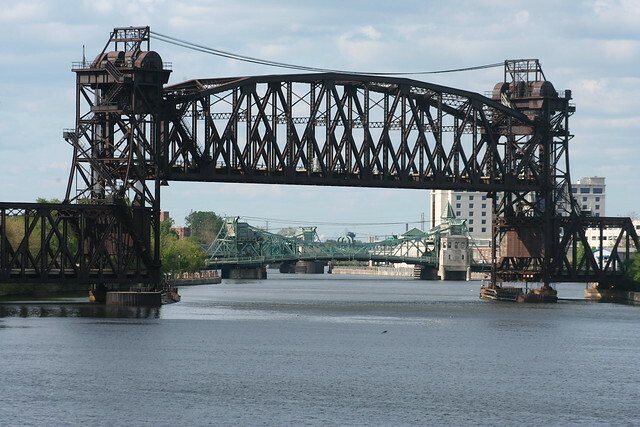 A total of five bridges once spanned the river at this location – 4 vertical lifts, and a single bascule bridge. 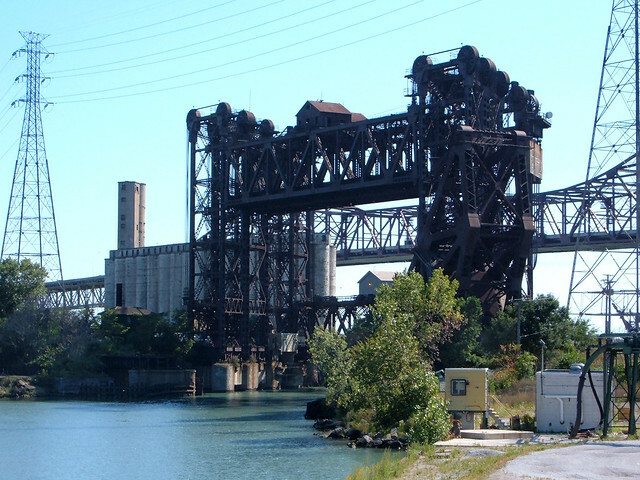 One of the lift bridges was demolished in the 1960s, and two more are abandoned, but they still form one of Chicagoland’s most impressive industrial sights. 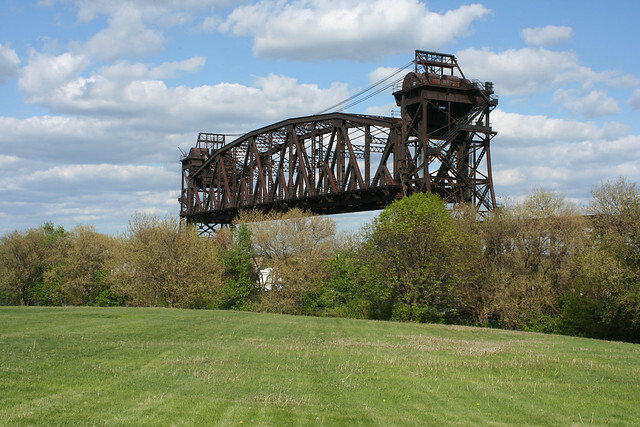 In the view above, the one active bridge stands alone on the right; the gap marks the location of its lost twin. 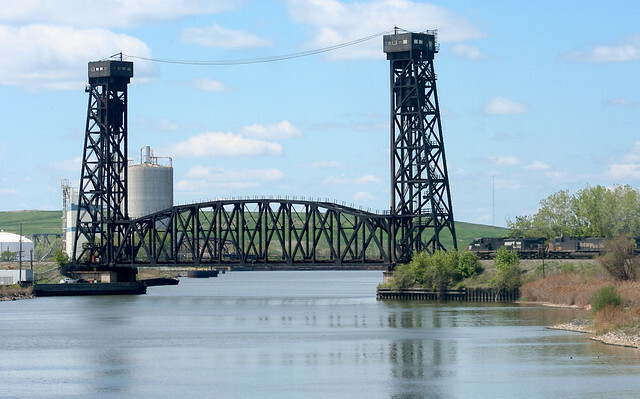 These two built for the Pittsburgh Fort Wayne & Chicago Railroad – eventually assimilated into its parent company, the Pennsylvania Railroad. 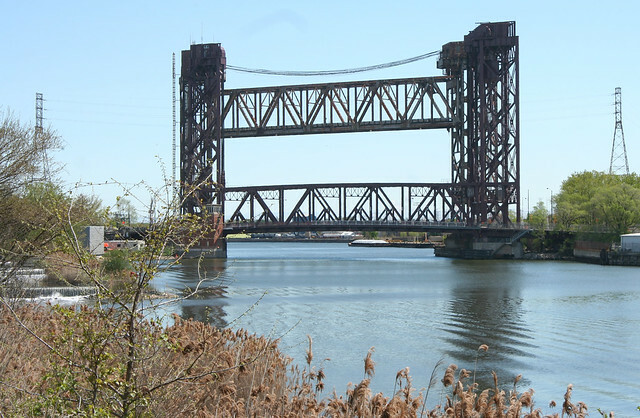 The demolished bridge was removed in 1965; two workers were killed when a crane failed, dropping the span into the river. 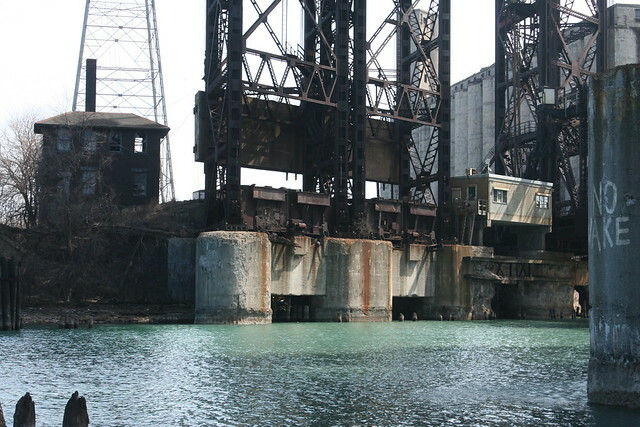 At center are two abandoned bridges originally built for the Lakeshore and Michigan Southern railroad, which soon after became part of the New York Central. The Pennsylvania and the New York Central merged into Penn Central in 1968, rendering these two obsolete and leading to their abandonment. 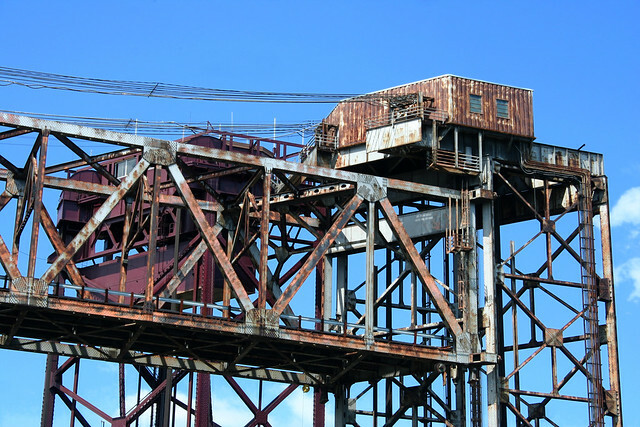 The bridge has since passed from Penn Central to Conrail to Norfolk Southern. 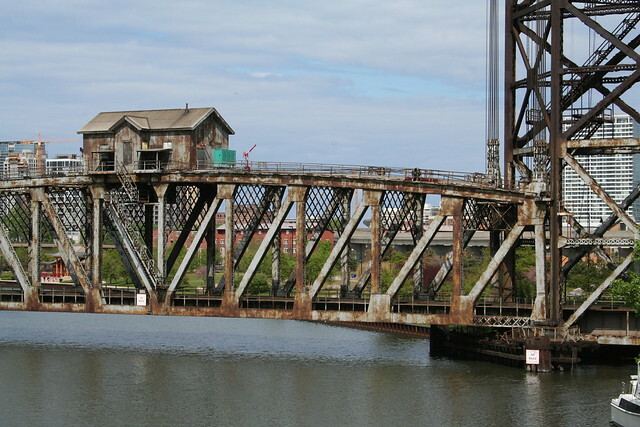 The left-most bridge is the half-destroyed bascule bridge, built by the Baltimore & Ohio Chicago Terminal Railroad. 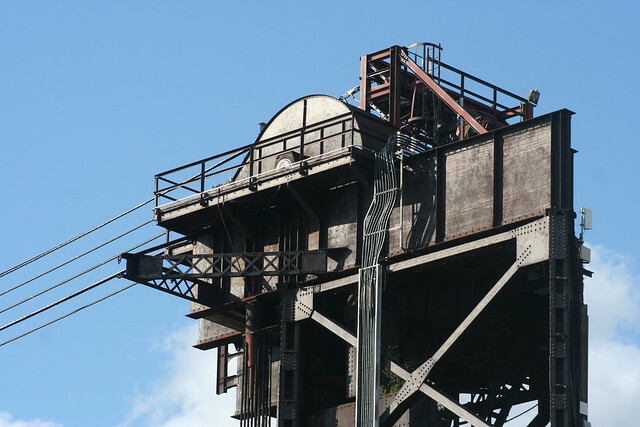 The towers are around 190 feet high, capped with massive cable winding sheaves that are 15 feet in diameter. 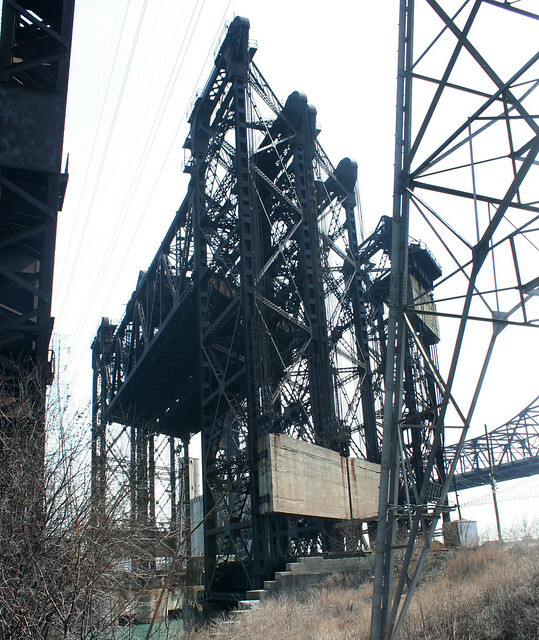 The Chicago Skyway bridge affords an excellent, if all too brief, view of the bridges’ upper workings. 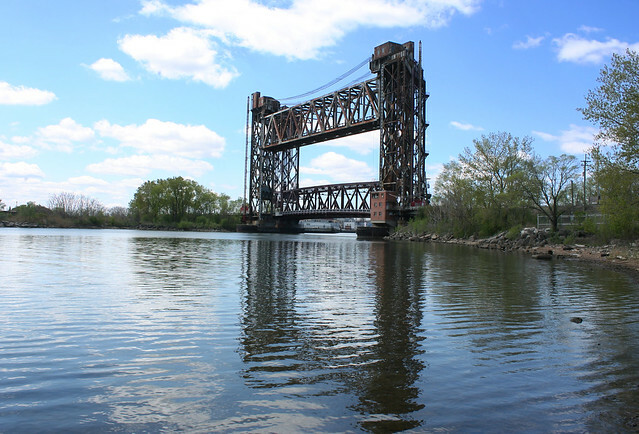 Spanning the Calumet River just before it empties into Lake Michigan, this single-track span is the newest vertical lift bridge in the region. 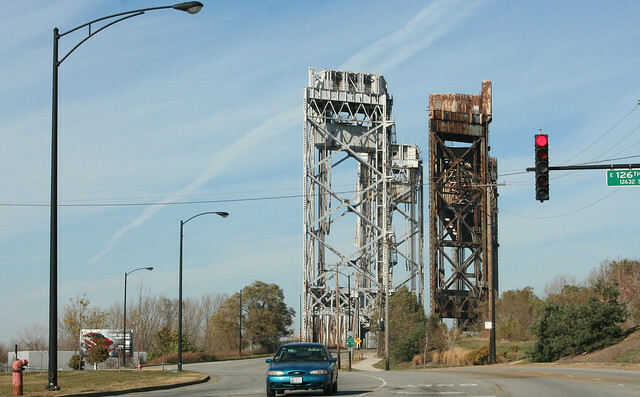 It’s not clear that the bridge is abandoned, but it clearly sees very little traffic. 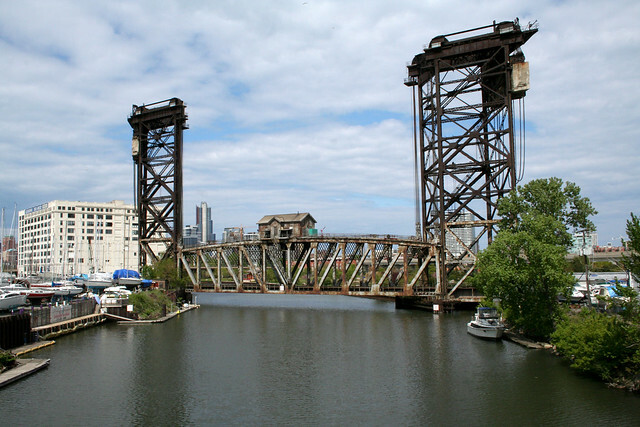 The heaviest lift bridge in the world when completed, this still-active bridge crosses the Chicago River south branch at Chinatown, carrying many Amtrak trains daily. It is raised twice a week during boating season. 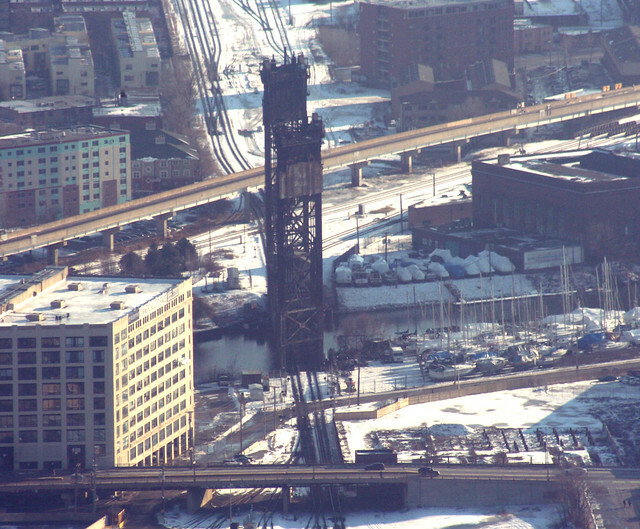 This entry was posted in Aerial Photography & Views from High Places, industry, Rail Bridges. Bookmark the permalink.